Place the eggs into a saucepan and cover with water. Cover and bring to the boil. Once it begins to boil, uncover and start timing for 10 minutes. Drain and cool under cold water, then peel. 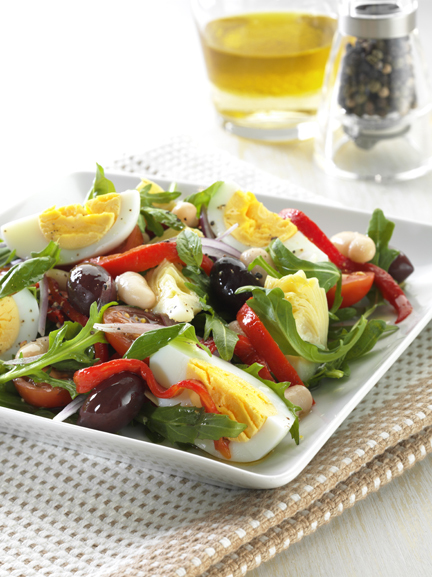 Arrange the rocket, artichokes, olives, capsicum, tomatoes, onion and beans into shallow bowls or onto plates. Cut the eggs into quarters and arrange on top. Whisk the oil, vinegar and mustard together with a fork. Drizzle over the salads, then sprinkle the basil over. Season with freshly ground black pepper.